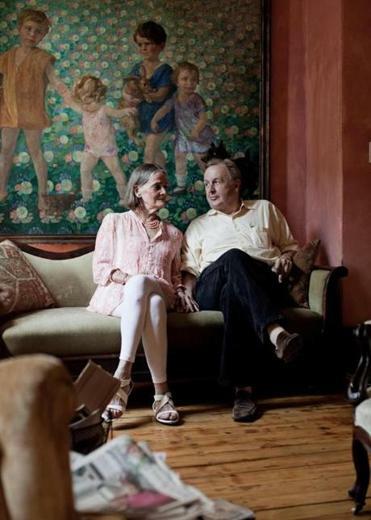 For decades poet William Corbett and his wife, Beverly, hosted a bustling salon in their South End home. Although they left town this summer, the writers and artists they inspired can only hope the spirit of the place is here to stay. 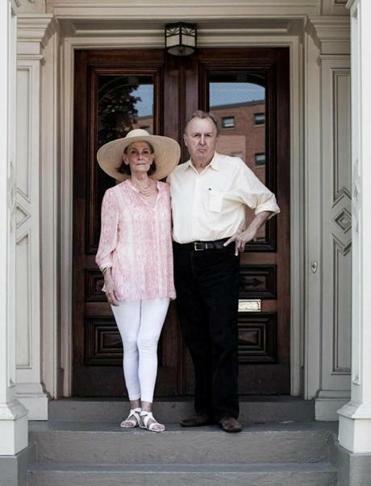 William and Beverly Corbett at 9 Columbus Square shortly before moving. After graduating Barnard in 1989 with a degree in English literature, Lahiri moved to Massachusetts to take classics courses at Harvard. She also found work at the cash register in a Harvard Square bookstore with a friend of a friend, Marni Corbett, a daughter of poet William Corbett and his wife, Beverly. Marni’s father, a tall man with a commanding, jowly face and mischievous eyes, used to visit the store to say hello to his daughter and to buy books. Big armloads of books. Creating community where none existed is what William Corbett was devoted to above nearly all else. The Corbetts lived at 9 Columbus Square, a red-brick town house in Boston’s South End. Although Lahiri didn’t know it then, it was an address where, on any given night, you might sit down to a gourmet meal alongside literary luminaries like Seamus Heaney, Siri Hustvedt, Paul Auster, John Ashbery, August Kleinzahler, Russell Banks, Basil Bunting, or Don DeLillo. Writing was celebrated there. Lahiri was soon invited to dinner at the Corbetts’ herself. On the appointed evening, she took the Orange Line in the wrong direction and turned up late. She was nevertheless welcomed into a kind of life unlike any she had previously known. In the Corbetts’ eat-in kitchen, where there was seating for 18, one could find a framed poem by their friend and Nobel Prize recipient Heaney, a rubbing of Ezra Pound’s tombstone, and drawings by the late Philip Guston. On the table were the little ceramic shoes that Beverly, a psychologist and self-taught chef, liked to collect. Above the fridge there was a painting of a pig with the words: “I WANT BEV TO COOK ME!” And then there were the guests — an ever-changing assortment of family friends and writers, students and artists. One day, in a bright room on the top floor, the once “terribly closed off” Lahiri began to write. Just sketches and ideas at first. But it gradually came to her, in this house, that this life, the life of an author, was one she could inhabit. She enrolled in courses at Boston University and began submitting work to journals. In 1999, she published her collection of short stories, Interpreter of Maladies, which went on to win the Pulitzer Prize. Now, however, that era has come to a close. Earlier this year, the Corbetts sold their house. It was a painful decision, but Beverly, 70, had retired from her work as a psychologist, and the couple wanted to move nearer their two daughters and three grandchildren in Brooklyn. Friends know the Corbetts are going to be just fine in New York, a city that has always been like a second home, even as some wonder who will fill their place in Boston. What the Corbetts created at 9 Columbus Square, however, was an ideal as much as a long string of convivial get-togethers. And in that sense, it is not the kind of thing that ever just goes away. But while attending the Wooster School in Connecticut, Corbett found people who seemed to understand him. Between his sophomore and junior years at the prep school, his French teacher, novelist Donald Braider, hired him as a baby sitter. Initially, the Braiders’ home felt foreign, bohemian. It was messy. They smoked. Their dog sucked spaghetti straight off a dinner plate on the table. And yet the Braiders treated Corbett like an adult. They offered him wine at his first dinner there. Their home was bursting with art, including works by Jackson Pollock (an old friend and their son’s namesake), Pollock’s wife, Lee Krasner, and Franz Kline, Mary Cassatt, and Pablo Picasso. Best of all, the house was overflowing with books. It felt, Corbett later recalled, as if he had arrived home. A harder and more lasting blow, however, had come some years earlier, when Corbett learned his father, a physician, had disappeared, abandoning his patients and family. The elder Corbett had fled with a mistress to Baghdad, leaving only a note on his office door that said: “I have gone to further my education.” Corbett never saw him again. The abandonment was a defining moment in Corbett’s life, says Beverly. It left him reeling, and with a permanent hole in his heart. But it also gave him a heightened sense of responsibility, an abhorrence of running out. Even before their daughters attended, the couple and their friends focused on turning around their local elementary school. “Many of our friends and relatives thought that we shouldn’t be trying to raise children and educate them in the South End,” says Watkins, who worked at the Boston Public Library. “It took a political passion which we shared to buck these opinions.” In a kind of extracurricular program, Watkins and her husband, Ben, who owned a Brookline bike shop, taught neighborhood kids weaving and geology at their house; Beverly, meanwhile, taught cooking at the Corbetts’ house, while Bill served as school lunch monitor and supervised kids on the playground. As Corbett began to focus on his own writing, he discovered another kind of community at the Grolier Bookshop in Harvard Square, a favorite gathering place of poets like Elizabeth Bishop and Robert Lowell. Their town house was “an extension of Bill and Bev – garrulous, welcoming, nourishing in every sense of the word,” says Jackson Braider. For established poets and newcomers alike, Corbett helped organize readings throughout Boston. He put up posters, set up chairs, and made the introductions. As well as founding and editing several literary magazines, Corbett in 1999 established Pressed Wafer, a small imprint focused on poetry, essays, and memoirs that he ran out of his home. CORBETT’S GENEROSITY did not come without costs to himself. 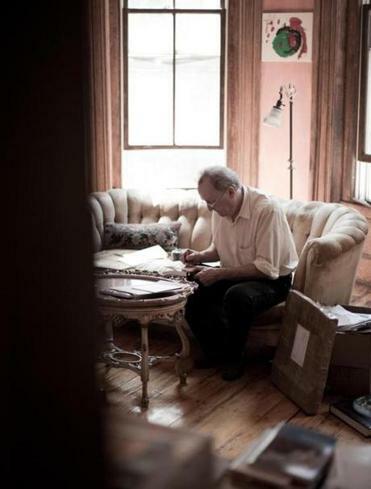 For one, although he steadily published a great body of work over the years, including 15 books of poems, two memoirs, and countless critical essays, he never really got his due as a writer in Boston, says Pease. “He had a complicated relationship to publishing and notoriety,” adds Howe. “Half of him would have loved it. But the other half of him identified with John Wieners, who had the magic touch of a true poet, but was completely neglected.” Howe says Corbett would have received far more recognition as a poet if he’d moved to New York 30 years ago. 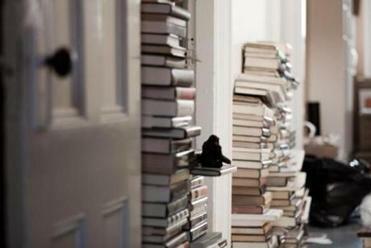 Paul Auster, who set a crucial scene of his “The New York Trilogy’’ at the home he’d visited for decades, thinks of 9 Columbus Square as “the hub, the spiritual heart, the exact center” of literary Boston. Over the years, the Corbetts together ambitiously pursued that goal of building community in their South End home. I experienced this firsthand. My wife and I were first invited to 9 Columbus Square for dinner in 2008. Like Lahiri before us, we struggled with the T and turned up embarrassingly late. But almost before we had taken off our coats, two tumblers of Scotch were in our hands, and we were led down the hall to meet regular guests Paul Auster and his wife, the writer Siri Hustvedt. On my second visit, a lunch for poet Michael Franco and his wife, Isabel Pinto-Franco, there were more than a dozen guests. There seemed to be no occasion for which the Corbetts wouldn’t open their home. The Francos, the first of seven couples to be married in ceremonies officiated by Corbett, were feted every year on their anniversary. The painter Trevor Winkfield celebrated his birthday at 9 Columbus Square every year (save one) for more than three decades. The anniversary party we attended was three years ago. It was winter. The snow was piled high along “windy, scouring Columbus/ Avenue,” as Corbett once described it in a poem. As I listened to Isabel recount how she and Michael met, I watched Beverly in the kitchen politely turn down repeated offers of assistance. Over the next several hours, wine was poured and poems specially composed for the occasion lustily recited. All this while Beverly placed on the table no fewer than nine dishes. Although Corbett was proved right — no one would take 9 Columbus Square from him — he couldn’t have predicted he and Beverly would give it up willingly. Now that their children are grown and have children of their own, the pull of family has proved stronger than the pull of place. Earlier this spring, during a gathering in honor of the Corbetts at Harvard, Bill seemed eager to downplay his and his home’s influence. “We’ve loved each other and our children in our house,” he said. “I don’t want it to be bigger than that.” And yet, for all the people inspired by it, by them, the Corbetts’ 9 Columbus Square was bigger. Of course, Pressed Wafer will continue bringing little-known writers to the larger audience they deserve. And the Corbetts’ many friends in Boston and beyond will surely continue to stay in touch. Yet many worry that the city will be poorer for the loss, that some poets of international stature will no longer feel so warmly and genuinely welcomed here, that there will be no more Jhumpa Lahiris coming to Boston and discovering themselves in that singular house. Sebastian Smee, winner of the 2011 Pulitzer Prize for criticism, is the Boston Globe’s art critic. E-mail him at ssmee@globe.com and follow him on Twitter @sebastiansmee.